It's morning! 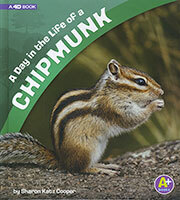 Skitter out of the nest to forage and stuff those cheeks up close with a chipmunk! Give young nature explorers and zoologists an exciting way to learn about the wooded habitats, physical features, and behaviors of this rodent hoarder by following it throughout one day. Plus, kids can continue exploring after the chipmunk goes to sleep! A step-by-step life cycle diagram, critical thinking questions, and further resources will keep fact-hungry kids learning about this burrowing critter. Bring augmented reality to your students by downloading the free Capstone 4D app and scanning for access to an online article, video, and discussion questions.